William J. Urick, 92, had plenty of uniforms, but he never needed a business suit. A retired Air Force Colonel who served in four branches of the military, the Secret Service, the Pennsylvania State Police and two Defense Department investigative agencies, Colonel Urick, at age 72, was sworn in as a uniformed police officer in Fairfax County, Virginia. He died of respiratory failure May 12, 2004, at Inova Fairfax Hospital. What prompted this Springfield resident to join so many branches of the service and police agencies? "He was an absolutely incredible investigator. He could spot patterns where there were no patterns. He was a bulldog," said one of his sons, William J. Urick III. "His field was investigations . . . and security." The Erie, Pennsylvania, native had dreamed of attending West Point. He was a teenager when he joined the Navy Reserve in 1930 and the Pennsylvania National Guard in 1931. He then enlisted in the Army to attend West Point Preparatory School at Fort Myer. Graduating during the depths of the Depression, he hounded the halls of Congress in search of an appointment to West Point, but the few that were available were spoken for. So Colonel Urick became a Trooper with the Pennsylvania State Police, stationed at the Greensburg barracks. Driving down a Pennsylvania road one night, on a date with the woman who would become his wife, he spotted a hitchhiker whose face he'd seen on a wanted poster. He picked up the hitchhiker, putting him in the front seat and his date in the back seat, where she held a coat hanger as a weapon to the wanted man's back. The pair drove the suspect to the police barracks, his son said. His preparation work for a visit by President Franklin D. Roosevelt apparently impressed some Treasury agents, because the Secret Service recruited him in 1940. He served with the agency until he accepted a commission in the Marine Corps in 1942. 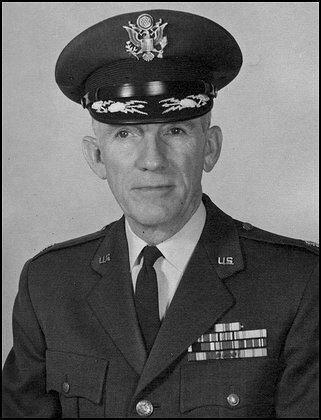 Colonel Urick spent World War II assigned to the State Department, serving as a special courier. He crisscrossed the Atlantic, delivering secret messages and invaluable documents to officials in Lisbon, London and North Africa. After the war, Colonel Urick returned to the Secret Service and served on President Harry S. Truman's detail. In 1948, Colonel Urick joined the newly formed Air Force Office of Special Investigation. He spent three years in Germany, a few years in Alaska as deputy commander of the office there and retired as a full Colonel in 1964. He then became a civilian officer with the Naval Investigative Service, now the Naval Criminal Investigative Service, and was involved in the formation of the Defense Investigative Service. After retiring from federal government service in June 1976, he devoted his efforts to the Neighborhood Watch program in Fairfax County. In 1979, Colonel Urick was appointed a Deputy Sheriff with the Fairfax County Sheriff's Office and, in 1983, was sworn as a uniformed officer with the Fairfax County Auxiliary Police Department. He retired in 1996, with a 10,000-hour service award, at age 85. Survivors include his wife of 66 years, Marietta Ellen Urick of Springfield; sons James J. Urick of Pittsburgh and William J. Urick III of Springfield; three granddaughters; and two great-grandchildren. Of Springfield, Virginia, on May 12, 2004. He is survived by his wife of 66 years, Marietta Ellen Urick; his two sons, James Jackson Urick and William J. Urick; three granddaughters, Kimberly Boykin, Heather Ellen Urick and Krissy Urick; great-grandchildren, Justin and Chandler Boykin. Funeral services will be held on Monday, June 21, 3 p.m. at Fort Myer Old Post Chapel.